My Mini Break From Everyday Life. We had the grand kids visiting for the last six days. Steve took the grand kids home yesterday and he is spending the weekend with dad at his house. This gave me two days of peace and quite…no cooking, cleaning and no responsibilities! Tonight I am thinking of ice cream for dinner and eating Nutella straight from the jar. What would you do with 24 hours with no responsibilities? i know you enjoyed those grands but like you, i need plenty of REST after they leave! enjoy your free time…it probably won't last very long! I think the pool and ice cream and nutella sounds absolutely perfect. Just recently my husband was traveling and my youngest son was on a trip. I was home alone for the first time in my 51 years on earth!! It was amazing! I stayed in my pjs all day one day! I found out being alone temporarily really invigorated me! Enjoy your day! That sounds like my kind of dinner! It is good to have some time to yourself. I would probably take a long walk at beach! I hope you enjoyed your free time. My grand QUADS came to visit yesterday! They are 2 years old and it was the best visit yet!! I didn't need much recovery time but their parents use up a LOT of energy loading up and unloading four babies so we really appreciated them coming!! By the way….I love your blog name!! ENJOY!! We all need a day like that every now and then! Oh I could eat ice cream every day for every meal! Yum! Except, I probably couldn't fit in my clothes anymore after doing that. Your pool looks so inviting. Ha ha Sherry ice cream and nutella sound like a good start to a perfect me time!!!!! 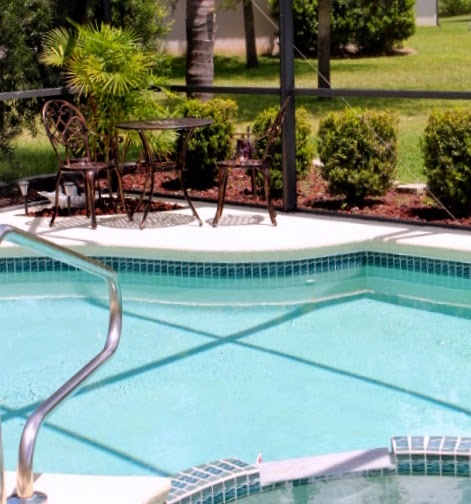 Enjoy every minute of the peace and quiet and just float in that lovely pool. I probably would multi-task around the house as usual, spend a ton of time online on my blog and shop and maybe go thrifting. All the usual, just no guilt for doing what I want!! So glad that you are taking a well deserved break…the pool looks so refreshing…I miss the days of sitting out by the pool…I love nutella over ice cream…but then again nutella out of the jar is great too!! !…Carpe Diem! !..